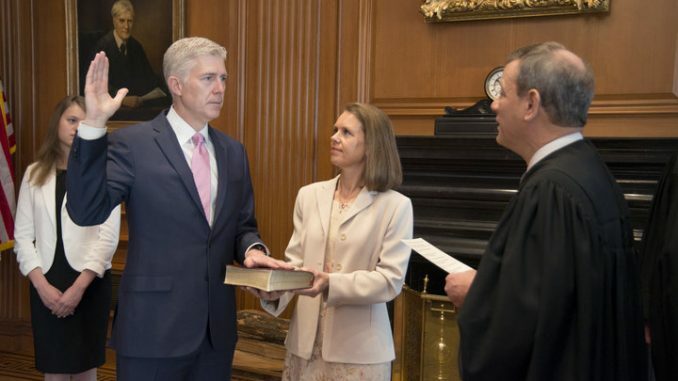 On April 10, 2017, Chief Justice John G. Roberts, Jr., administered the Constitutional Oath to the Honorable Neil M. Gorsuch in a private ceremony attended by the Justices of the Supreme Court and members of the Gorsuch family. The oath was administered in the Justices’ Conference Room at the Supreme Court Building. Chief Justice John G. Roberts, Jr., administers the Constitutional Oath to Judge Neil M. Gorsuch in the Justices' Conference Room, Supreme Court Building. Mrs. Louise Gorsuch holds the Bible. On a particularly chilly Monday morning in March, the Senate Judiciary Committee began confirmation hearings for the Trump administration’s Supreme Court nominee, Judge Neil Gorsuch. The hearings came at a perfect time for the Republican Party. After a failed healthcare bill, a series of blocked executive orders, and a highly contentious standstill on the federal budget, Gorsuch’s confirmation promised to be a win for a party that had so far struggled to make the tangible changes that the president promised during his 2016 campaign. Judge Gorsuch’s impressive credentials stacked the deck heavily in favor of the nominee from the beginning. A decade on the federal appeals bench, a rating of “well-qualified” from the American Bar Association, and the support of several legal officials who served under President Obama provided Mr. Gorsuch with the academic and professional clout to withstand even the harshest Congressional inquiry. Unlike other Trump nominees, who were forced to divert questions away from their body of work (or lack thereof), Judge Gorsuch relied heavily on his years of judicial rulings to shield himself from attempts to discredit him by Senate Democrats. One example of this occurred when Senator Diane Feinstein accused Gorsuch of never ruling for the “little guy” and favoring large corporations over private citizens bringing lawsuits. Rather than dodging the question with ideological platitudes, Judge Gorsuch began to cite a long list of holdings in which he had ruled in favor of plaintiffs who were facing far larger opposition from corporations. This response left Senator Feinstein scrambling for a retort and illustrated the power of facts in a political climate all too defined by synthetic sensationalism. Judge Gorsuch was by no means a centrist pick for the job. His strict constructionist perspective on the Constitution, conservative approach to social issues, and Reaganesque opinions on the role of government suggest that he is a conservative judge who will likely shift the Court to the right. Judge Gorsuch’s specific opinions on many controversial issues, however, still remain unknown. During his hearing, Mr. Gorsuch on many occasions avoided committing himself to specific viewpoints. This refusal to make divisive statements on specific issues reached a climax when Gorsuch almost refrained from strongly endorsing the Brown v. Board of Education decision that desegregated schools throughout the country. Gorsuch’s avoidance of delicate issues, while often frustrating, was also refreshing. Compared to the contentious confirmations of other Trump nominees, Gorsuch’s hearings felt civil and dignified. For a Senate that has just confirmed an attorney general who was previously deemed too racist to be a judge, an education secretary who didn’t seem to understand the debate between proficiency and growth, and a HUD secretary who doesn’t remember running for president, it is hard to raise public outcry about a mild-mannered conservative from Colorado. Even this general air of civility, however, did not stop top Democrats from threatening to filibuster Gorsuch’s nomination. Republicans all but invalidated this threat with the so-called “nuclear option,” changing Senate rules to confirm Judge Gorsuch with only a simple majority vote. Now confirmed, Associate Justice Neil Gorsuch’s has assumed a spot on the Supreme Court which he will likely occupy for decades. Justice Gorsuch’s nomination represents the first and most impactful victory of the Trump Presidency, a victory that will shape the direction of American jurisprudence well into the future. Is Egypt Violating Its Own Freedom of the Press Laws?